Not all barns are predator magnets; some may be seasonal attractors while others produce year-round. Location is one of the primary features to consider when staking out a probable predator barn, and it all starts with evaluating what the habitat has to offer. In parts of the country, one of the major driving forces behind why barns and farmyards are becoming such an appealing habitat — not only to predators, but for deer, turkeys and more — is the decrease in natural surroundings. As an expanding human population seizes natural habitat for housing, business and recreational development — not to mention farming — the actual area in which animals have to live, shrinks. Combine this with growing predator numbers across much of the country, and these animals have to turn somewhere for food and protection. Over the years, generally speaking, I've observed two types of predators that utilize barns: shy ones and brave ones. The shy predators are those unwilling to broach the human gap and associate with people. The brave ones don't seem to care in the least about people, road traffic or unnatural noises, for their one and only interest in is attaining food. That said, shy predators more frequently occupy barn habitats that are removed from human activity. Out West, I've found barns located on hillside terrain to be the most productive for the wariest predators. These are barns that are tucked away in the trees or along forest fringes, and see little human action during the course of the year. They might get hay bales stowed in them during summer, and are visited periodically in winter when hay is extracted. For the most part, though, these barns largely remain dormant. Because such barns see little human infringement, they have the ability to attract a variety of predators. Even old, abandoned livestock barns in these higher elevations can turn into prime predator habitats, and it all has to do with food. Hill country barns are notorious for attracting rodents. Rodents flock to such habitats for the ease of nesting materials, to seek protection from harsh winter elements and access readily available food — all within a fairly small territory. 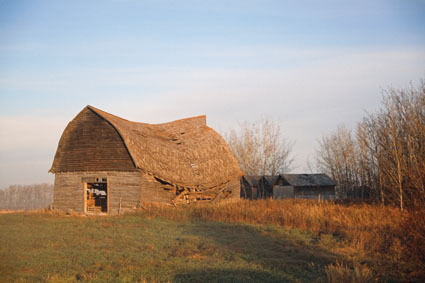 As barns age, they offer more protective habitat, often in the form of surrounding brush, tall grass and even trees. With an increased level of maturation within this habitat, more animals gravitate to barns, namely insects, birds, rabbits and even turkeys and deer. With an influx of habitat and potential prey species taking root around such structures, the stage is set for predators to enter the picture. One of my favorite late-winter coyote barns finds the canines attracted to the area because of turkeys. The turkeys actually move into the barn, not only to take regular dust baths in the dry dirt blanketing the floor, but to roost in the open rafters. Knowing this, coyotes move in, and can be called using nothing more than yelps, clucks and excited turkey talk. Other sounds that can produce in barn settings are rodent and fawn distress calls. Deer will often gravitate to hillside barn habitats, for the forage. At the same time, some does and young take up residency near barns and remain there year-round. Likewise, rodents are attracted for the same reasons, and putting these calls to use, versus overused predator calls, can make the difference. In country where barns are situated along ridgelines with multiple ravines, thick draws and big timber, loud, aggressive calling might be essential to get a predator's attention. In such broken terrain, sounds are squelched, especially on windy, rainy days. In these conditions, a loud, electronic system is preferable, as well as a loud mouth call. On the opposite end of the barn spectrum, are barns teaming with human and farm animal activity. When predators are seen here, they show little fear of humans and simply focus on food. Compared to remote barns, it's hard to determine whether more animals are actually using these, but they are more frequently seen in the area, simply due to increased levels of human activity. Be it mid-day or during the night, such exposed barn settings can attract predators at any time. As with remote barns, open-country barns attract predators because of the food they offer. However, these offerings can be more seasonal, and hinge on such factors as lambing and calving times, hay harvest and grass-seed planting. The livestock will directly attract predators, while the agricultural activity will bring in food sources. Not far from my home, situated less than 20 yards off a well-traveled paved road, cougar sign had been discovered. The cat had come down out of the hills, and was clawing its way through silage — rotting straw wrapped in big bundles of plastic —placed under a pole barn. The claw marks left no doubt as to what caused the damage to the white coverings. What attracted the cat were the rodents. You could stand by the bundles and listen to the mice and voles scurrying about in them; ground squirrels also took up residency there. It was obvious that the cat found a reliable food source and knew it had a good thing going. Hunters tried calling that cat in with no success, but they were focusing their efforts in the wrong area. Had the hunters chose to move a half-mile across the farmland, into the hills where the cat lived, their chances of calling in that cougar would have increased considerably. The open terrain surrounding the barn simply made the cat feel too vulnerable. Had the cat even heard their calls, it's highly unlikely it would have come in simply due to the improper setting. On another property, a cougar routinely killing barnyard livestock. This time the prey was goats, and as the ranchers moved them into the lowland pasture and barn to drop their kids, a cat followed. The cougar was killing in the barnyard, and had been seen at night. Taking to the hills, one of the ranch hands armed himself with a predator call. He studied the terrain and narrowed down the habitat that he thought the cougar would be utilizing. His hunch paid off, as the cat came to his call, and fell to one well-placed shot. The goat killing stopped. 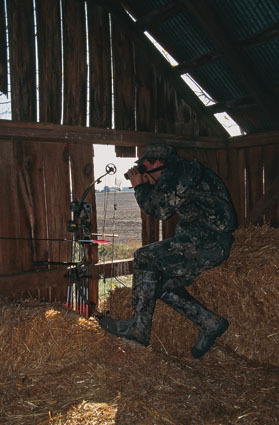 While open-country barns are ideal predator attractants, they are not always the best blind from which to hunt. Under the cover of darkness, these barns can yield good results where nighttime hunting is legal, but for the most part, they are tough to hunt in the day. That's not to say they can't be productive; they can, under the right conditions. The key to hunting from barns and amid their surrounding habitats successfully lies in first figuring out the game. Learn what animals are using the area, then ask yourself why they are using it. From that point, evaluate if the target species can be called from the barn, or if it's necessary to relocate in thicker habitat prior to initiating the calling sequence. Once the habitat is assessed, and the behavior of the predator taken into consideration, the odds of successfully hunting a barnyard will increase. Based on the activity of the food sources around the barn and the time of year it's being hunted, determine which calls will work best and if decoys will be of benefit. 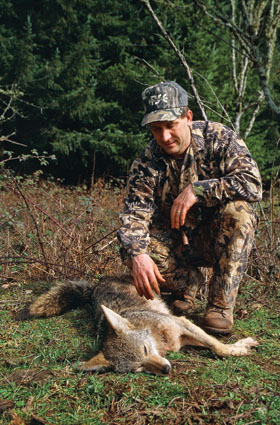 When all of these factors are considered, a comprehensive approach to hunting barns develops, something which a growing number of predator hunters are discovering and cashing in on.